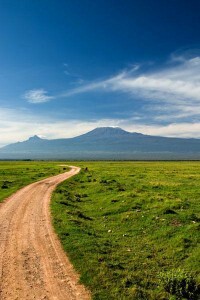 Amboseli National Park is one of the less visited, but no less attractive of Kenya ’s beautiful parks. Situated in the south of the country, it offers visitors spectacular views of the highest mountain in Africa. 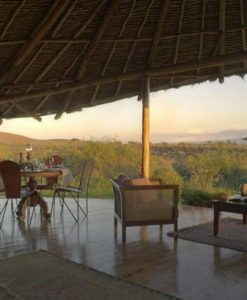 Few people in the world are unfamiliar with the awe-inspiring sight of snow-capped Mount Kilimanjaro, which forms a backdrop to scattered, flat-topped acacia trees and magnificent elephant herds passing through. In Amboseli, the cliché becomes a reality. The arid and semi-arid landscape was traditionally shared by both, indigenous pastoralists, the Maasai, and wildlife. The mainly flat area is carpeted, depending on the season, with golden-brown or green grass. Vegetation is scarce in the drier lands, with the main plant being the elephant grass, a whitish-yellow grass, which can reach an elephant’s height. 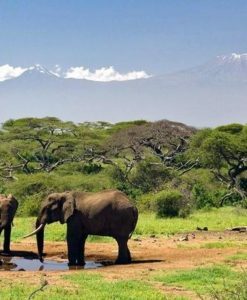 Apart from the mostly dry and salty Amboseli Lake, the park is also blessed with fresh underground water from Kilimanjaro, the largest free-standing single mountain in the world. The water contributes to the formation of swamps and marshlands, confined by Cyprus grass, papyrus, and groves of fever trees with greenish-yellow bark. These blameless trees were originally held responsible for causing Malaria, before the real perpetrator, the Anopheles mosquito, was discovered to be culpable. Apart from the “Big Five” – lion, elephant, buffalo, leopard and rhino. The chances of seeing zebras, antelope, gazelle, hyenas, baboons, ostriches, and giraffes, are high. Altogether, Amboseli is home to well over 50 different species of mammals. The close to 500 different bird species is an open invitation to some rewarding bird watching. In 1883 Joseph Thomson, eponym of the Thomson’s gazelle, was the first European who saw the snows of Kilimanjaro, now evoking memories of an old Hollywood movie based on a short story by Ernest Hemingway, a frequent visitor to Kenya. Of course, Hemmingway came to Kenya at a less environmentally conscious time, when hunting was still done with rifles, not with cameras. This beautiful land was called Embosel (salty dust) in the Maa language of the indigenous Maasai. 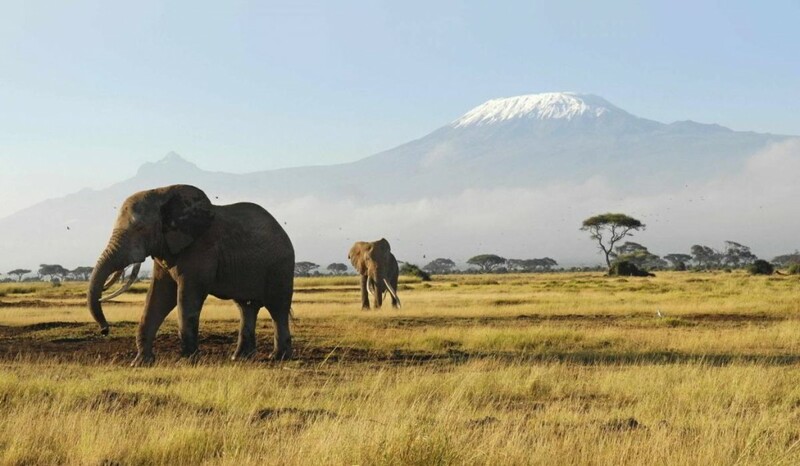 Having been declared a national park in 1977, Amboseli quickly gained a reputation for being the best place in Kenya to watch vast numbers of free-ranging elephants, sporting some of the largest tusks seen in Kenya. One of the most famous African tribes, the Maasai, self-declared owners of all cattle in the world, clad in their typical red cloths, adorned with amazing bead jewellery and naturally dyed, waist-length red braids, populate the area. For millennia the Maasai have grazed their herds and lived in temporary homesteads, known as ‘manyattas.’ These small longish structures are built by the women from mud, cow dung and ash. The surrounding wall of thorny branches serves to protect the precious cows from indigenous predators. With the conflict between the ecosystem and its human inhabitants increasing, the Maasai have sadly been marginalized into community farms outside the park. They can still be admired in their full beauty serving as security staff for the lodges and when performing their sonorous, humming group songs, accompanied by their famous jump dance. Coming by car means using long and dusty roads, but green bushes sidelining tracks of crimson red soil, provide the ubiquitous images that people have come to associate with ’Mother Africa’. To top off the vibrant scenery, occasional, tantalizing glimpses of Mt. Kilimanjaro make the 6 to 7-hour journey more bearable. Should you prefer to avoid the rigours of the road, frequently available 30 to 40-minute flights to the park to alleviate the hot, bumpy trip significantly.